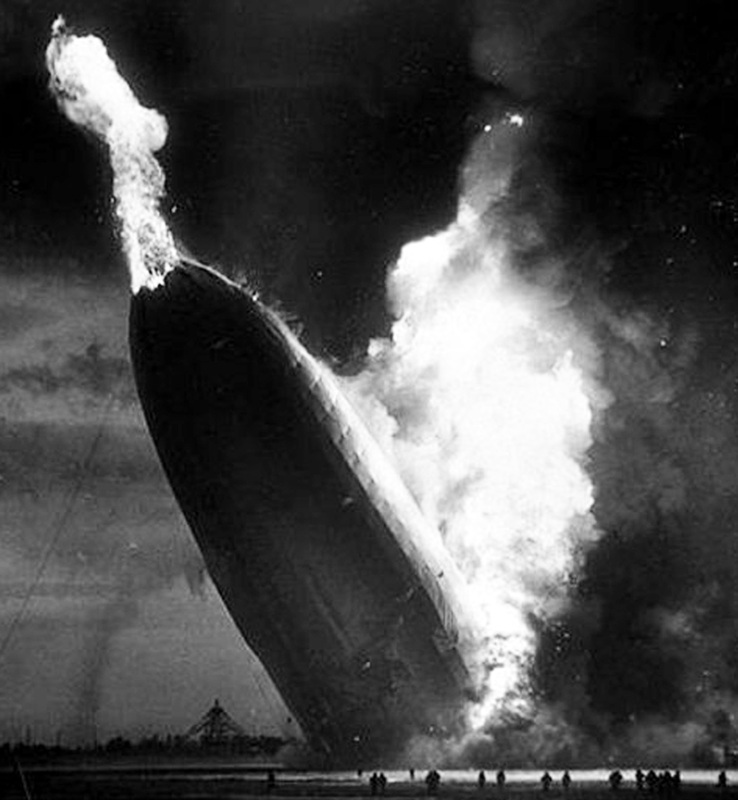 Many hydrogen fuel advocates falsely claim that hydrogen was not responsible for the Hindenburg disaster. In fact, the Hindenburg was just one of dozens of hydrogen airships destroyed by fire as a result of their highly flammable lifting gas. This idea originated with Addison Bain, and comes from the fact that Hindenburg’s fabric covering was doped with a solution that included aluminum powder, and in certain sections iron oxide, which are sometimes used as components in solid rocket fuel. Hindenburg’s cotton-canvas covering was doped to keep it taut for aerodynamic reasons and to protect it from damage from water, wind, and small objects hitting the surface. The dope was a solution of cellulose acetate butyrate to which aluminum powder had been added. At the top of the hull, a layer of iron oxide was applied to the inside surface of the covering to protect the fabric from the UV radiation in direct sunlight (see color photo below). The aluminum powder gave the ship its silvery coloring, but its practical purpose was to reduce the heating effects of the sun, which can cause an airship’s gas cells to expand and release their gas. While certain rocket fuels contain aluminum powder, that does not mean that everything containing aluminum powder is a rocket fuel. Aluminum powder has many uses other than rocket fuel, including the manufacture of photovoltaic solar energy panels and metallic paints for cars, boats, furniture, and other items. And none of these tend to explode. The chief ingredient in rocket fuel is not aluminum powder but an oxidizer (a substance which creates its own oxygen supply to support combustion) and without an oxidizer, in sufficient quantity, you don’t have rocket fuel. A solid propellant always contains its own oxygen supply. The oxidizer in the Shuttle solids is ammonium perchlorate, which forms 69.93 percent of the mixture. The fuel is a form of powdered aluminum (16 percent), with an iron oxidizer powder (0.07) as a catalyst. The binder that holds the mixture together is polybutadiene acrylic acid acrylonitrile (12.04 percent). In addition, the mixture contains an epoxy-curing agent (1.96 percent). The binder and epoxy also burn as fuel, adding thrust. The oxidizer is by far the largest component of rocket fuel; approximately 70% in the case of the Space Shuttle, compared to 16% aluminum powder. The only substance in Hindenburg’s doping compound which could conceivably act as an oxidizer was the iron oxide added to one section of the covering, but it was in too small a quantity (one of six layers of dope, or approximately 17%) and was too separated from the aluminum powder to act as an effective oxidizer in this application. At no point in the doping process were the aluminum powder and iron oxide mixed together, and most of the iron oxide was applied to the inside surface of the fabric of the upper hull (as seen in the photo at right), while the aluminum powder was applied to the outside of the hull. Without an oxidizer, even the Space Shuttle would still be fizzling slowly at its launch pad in Florida… just like this theory. Perhaps the best evidence that the Hindenburg was not painted with “rocket fuel” are the films and photographs of the disaster. If the Hindenburg had been painted with anything remotely as flammable as rocket fuel, its covering would have burned quickly, and would have been totally devoured by the fire, but that did not happen as you can see from films and photos of the tragedy. Unfortunately the truth is a little more boring, and a lot more technical. While it is true that a thermite reaction can be created by mixing aluminum and iron oxide, it requires a ratio of about 1 part aluminum to 3 parts iron oxide [download pdf]. The dope used on Hindenburg’s silver-colored hull contained 5 parts aluminum to 1 part iron oxide. In other words, Hindenburg’s dope contained less than 1/10 the amount of iron oxide needed to create a thermite reaction. In addition, a thermite reaction requires the components to be well blended, and if they separate, the mixture is useless. The aluminum powder and iron oxide on Hindenburg were applied separately, in different layers, and were not mixed together as would be required to create thermite. In defense of the “thermite theory” Addison Bain refers to what he calls “thermite hot spots” — a few very small small points where he found iron oxide in one layer of dope to have bled through to the layers of aluminum powder — but Bain does not offer any evidence of how widespread this might have been, or any evidence that a significant thermite reaction occurred during the burning of the Hindenburg. The best evidence that no significant thermite reaction took place are the photographs and films of the fire. As mentioned above, iron oxide was applied only to the upper portion of the Hindenburg, to protect the covering from the sun’s UV rays. (The lower part of Hindenburg’s hull was doped only with aluminum, since there was no point in applying the additional weight of iron oxide to a part of the ship not exposed to the sun.) Films of the Hindenburg fire show no difference in the speed at which the upper hull burned as compared to the lower hull. If the aluminum powder and iron oxide on the upper hull had really created a thermite reaction, the upper hull would have burned much faster than the lower hull, but it didn’t. In fact, the only lines of demarcation seen in the photographs of the fire are between gas cells, because it was primarily the hydrogen — and not the covering — which was burning. This is the generalized version of the “rocket fuel” and “thermite” myths. Certain hydrogen advocates have tried to argue that the Hindenburg’s covering was so highly flammable that it was the covering — and not the hydrogen — which was the primary factor in the ship’s rapid destruction. In fact, the Hindenburg’s covering, while certainly combustible, was not especially flammable and actually burned quite slowly. Many sections of the covering burned only when exposed to the direct heat of burning hydrogen (as seen in the films and photographs of the disaster) and large areas of the covering never burned at all, indicating that the covering could not have been highly flammable. Hydrogen flames shoot through the bow, while the surrounding covering has not yet ignited. Some discussions of the Hindenburg incorrectly claim that the dope contained cellulose nitrate, rather than cellulose acetate. In fact, the designers of Hindenburg deliberately avoided cellulose nitrate precisely because it was known to be flammable, and they chose the safer cellulose acetate instead. The dangers of cellulose nitrate were well understood at the time, since it was used in the first photographic films which were known to be highly flammable. Cellulose acetate filmstock was introduced as an alternative in the 1920s, and was known as “safety film” [PDF]. There is some evidence that Hindenburg’s fabric might have been sufficiently flammable to be the initial source of ignition (although that is not likely in the wet and rainy conditions at the time of the crash). But the covering was not so highly flammable that it was a major factor in the destruction of the airship. Hydrogen burning around a section of the covering which has not yet ignited. Even the television show Mythbusters declared this myth as busted. And you can see for yourself that the Hindenburg’s covering was anything but highly flammable. Photographs of the wreckage show that even after a fire so intense that it destroyed an 800-foot airship in about 34 seconds, sections of the covering still remained unburned. If the Hindenburg had been inflated with helium rather than hydrogen, even if the fabric ignited as the result of an electrical discharge, the small resulting fire would not have been a major catastrophe, and there would have been many hours available for a safe and orderly evacuation. This myth contends that since hydrogen burns with a mostly invisible flame, and since the Hindenburg’s flames were red or orange, it could not have been the hydrogen that was burning. The same photograph colorized green. So if anyone shows you a “color photo” of the Hindenburg disaster to support a theory about the cause or progress of the fire, just chuckle at them sympathetically. But the original black & white photographs do show flames that are clearly visible, and it is true that hydrogen burns with a mostly invisible flame, so how can that be? Here’s the simple explanation: Hydrogen does burn invisibly… but only when hydrogen is the only thing burning. As the Hindenburg was consumed by flame, it was not only the hydrogen which burned; it was also the canvas covering, the aluminum alloy framework, the steel bracing cables, the gelatine-cotton gas cells, the tanks of diesel fuel, and even the tables and chairs. And no-one has ever claimed that canvas, aluminum, steel, or diesel fuel burns with an invisible flame. In addition, not only did the rest of the Hindenburg’s components emit color and light as they burned, but they also acted as a mantle. A “mantle” is the part of a gas lamp that glows to emit light. Most flammable gases burn without color, which is why gas lanterns always use a mantle; the gas burns and creates heat, but it is the mantle which glows and emits light. The aluminum girders and steel bracing wires of the Hindenburg were the largest mantle in gas lamp history. Dozens of hydrogen-inflated airships other than the Hindenburg also exploded or burned, including German zeppelins which were shot down over England during WWI, and all burned with brightly visible flames — just like the Hindenburg. This is probably the most absurd myth about the Hindenburg disaster, yet it is frequently promoted by hydrogen fuel advocates. Whatever caused the initial ignition of the Hindenburg fire, the airship was incinerated in less than a minute — and came crashing to the ground as smoldering wreckage — because virtually the entire space of the ship’s 800-foot hull was filled with highly flammable hydrogen. Yet many hydrogen fuel advocates insist that the millions of cubic feet of hydrogen in Hindenburg’s gas cells (representing, according to Addison Bain’s own estimate, over a billion BTUs of energy) somehow had no effect on the ship’s passengers and crew when it burned. Sixty-two persons from the Hindenburg lived through the disaster by being fortunate enough to ride the Hindenburg down and escape the flames and wreckage that fell to the ground. Many of these survivors were relatively unharmed. In all of this, the hydrogen was innocent. In the terrible disaster, the Hindenburg burnt with a red flame. But hydrogen burns with an almost invisible bluish flame. 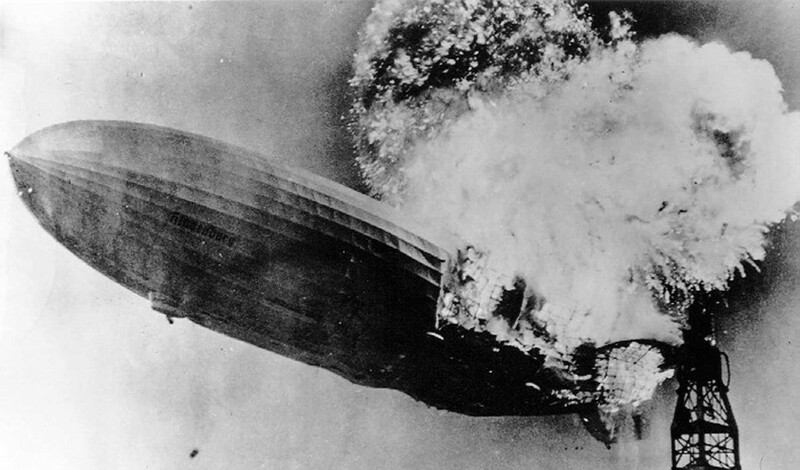 In the Hindenburg disaster, as soon as the hydrogen bladders were opened by the flames, the hydrogen inside would have escaped up and away from the burning airship – and it would not have not contributed to the ensuing fire. The hydrogen was totally innocent. The clean hydrogen flames [emphasis added] swirled above the occupants of the passenger compartment, and all those who rode the airship down to the ground survived. Thirty-five of the thirty-seven casualties perished from jumping to the ground, and most other injuries resulted from diesel burns. How does one even begin to address the claim that over 5 million cubic feet of hydrogen can burn in about 34 seconds, and completely destroy an 800-foot airship, and yet not injure any of the passengers or crew? Burning hydrogen caused the duralumin framework to collapse on passengers and crew still trapped within the wreckage. 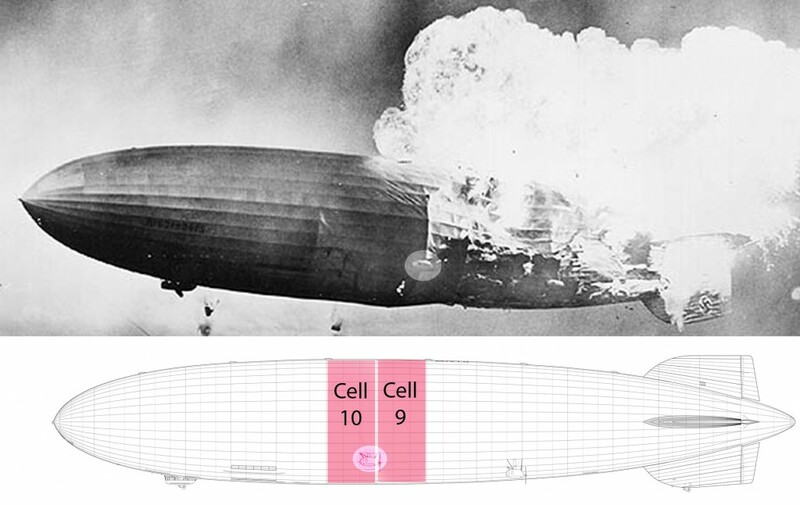 One could review the scientific evidence (above) demonstrating that the covering alone would have taken up to 40 hours to burn, so if the Hindenburg had been inflated with helium, the passengers and crew would have had ample time to exit to safety. One could list the fatalities of the Hindenburg disaster and describe how each one died. Hindenburg historian Patrick Russell has a brilliant blog which describes the fate of each person on Hindenburg’s final flight. Patrick’s research conclusively refutes the oft-cited claim that “35 of the 37 casualties perished from jumping to the ground” rather than from the fire itself, although even if that claim were true these victims would not have needed to jump from a burning airship in the first place if the Hindenburg had been inflated with helium rather than hydrogen. One could refer to a diagram [click to view] showing the locations of the crew (survivors in green, casualties in red). Crew members and passengers who were in a position to exit quickly generally lived, while those who were trapped in the ship as it settled to the ground died in the fire. One could point to the respected scientists and airship experts (both at the time of the crash, and today) who agree that the presence of hydrogen which was responsible for the severity of the catastrophe. One could consider the lack of fire in the many incidents and accidents involving helium-inflated airships, including the crash of the USS Shenandoah and the USS Akron (which were both, by the way, doped with an aluminum powder solution). Or one could simply watch the film of the disaster once again, watch the hydrogen furiously burning and consuming the ship in a matter of seconds, and approach the matter with basic common sense. But perhaps the larger point is the absurdity of this debate itself. In their determination to exonerate hydrogen at all costs, hydrogen advocates like Greg Blencoe and others have made the macabre, autopsy-like argument that it was not the hydrogen itself which killed the victims of the Hindenburg, but other things (diesel fuel, burning material from the cabins, jumping from a great height… anything but hydrogen). But even if those arguments were true — which they are simply not — do the hydrogen advocates really think it matters what particular substance (hydrogen, diesel fuel, or burning bed linens) caused particular injuries, since the Hindenburg itself would not have crashed to the ground in less than a minute if had not been inflated with hydrogen? These arguments are like claiming that the San Francisco earthquake of 1906 did not cause many casualties, since most of the deaths were actually caused by the ensuing fire, and not by the earthquake itself. Many of the myths about the Hindenburg disaster — from the nonsense about rocket fuel to the absurd claim that nobody was injured by the hydrogen fire — have been circulated and promoted by hydrogen advocates who seem determined to prove that anything but hydrogen was responsible for the destruction of the Hindenburg and the deaths of its victims. The National Hydrogen Association website publishes an FAQ and distributes a “Fact Sheet” [pdf] which make a similar claim. They are correct. The hydrogen was gone in less than a minute… because the entire airship was gone in less than a minute. How do the hydrogen advocates expect to be taken seriously on other matters relating to science and technology, when they are willing to put their names, websites, and reputations behind unscientific urban myths and absurdly illogical arguments? The great irony is that the nonsensical claims about the Hindenburg disaster offered by these hydrogen advocates, which so badly undermine their own seriousness and credibility, are completely unnecessary to their cause. The fact that hydrogen was responsible for the Hindenburg disaster is completely irrelevant to whether or not hydrogen makes a good alternative to fossil fuels. In fact, hydrogen could (theoretically) be both a wonderful alternative fuel and a terrible lifting gas for passenger airships; there is no necessary contradiction between the two. Many substances which are ideal for one application are hazardous in another, and hydrogen advocates like those mentioned above, who can’t seem to understand or express this simple concept, just raise questions about their own analytical abilities. Many people support solar energy, but they don’t feel the need to claim that sunlight never causes skin cancer. Hydrogen in a passenger ship is bad. But what about hydrogen in an unmanned aerial vehicle? A great deal of fabric never burned and a large quantity was picked up by various people at Lakehurst. Thank you for this website and the associated forum. Very interesting indeed. If the iron oxide was supposed to offer protection against UV, why was it applied to the INSIDE of the fabric? To protect the gas cells. Explain why the Graf Zeppelin, LZ 127, was so successful as it was also filled with Hydrogen. It has gone around the world and to the pole with no injuries. I think Hydrogen is safe to use if done right like rocket fuel in rockets. Hydrogen is itself flammable enough for this discussion, without your additional inflammatory hyperbole, isn’t it? The Germans never switched from helium; they never had helium in the first place. Dan, Sam is correct: The Germans switched the design from helium with small inner cells of hydrogen to pure hydrogen after efforts to procure helium from the US failed. Secretary of the Interior Harold Ickes was vehemently opposed to export of helium to Germany, as his diaries make extremely clear. Actually, America refused to give the helium to Germany because they were against them. Therefore, Germany had to use hydrogen. No, that’s not true. The exportation of helium was prohibited by an American law passed when Germany was a democracy, six years before the Nazis took power. Something interesting is that, because the Germans couldn’t get helium and were forced to use hydrogen, they were able to expand the inner areas of the ship. I would not want to be anywhere near a fire that was producing helium, because whatever it is that is burning is some sort primary explosive. I think people made the disaster. Hydrogen was just an innocent bystander that did exactly what it always does. You seem to be missing the point: Yes, the hydrogen MAY have leaked, but the fact that the hydrogen escaped and combusted STILL puts it at fault for its massive flame it created. When something burns, it needs a fuel, and the hydrogen was its fuel. It was the hydrogen that was burning. Hydrogen as the fuel and oxygen in the air as the oxidant.